Chill on a transforming alien beach in The Beach, Harmonix Music VR’s chill, introductory experience. If you’re new to VR, or just feel like sitting down and relaxing to your music, this world is a great place to start. Trigger visualizations and move throughout the beach, or simply sit back and see how your song transforms the scene. Explore your creative side by creating reactive 3D drawings in The Easel. Get creative as each brush and object reacts differently to the music. Once you’ve created your masterpiece, be sure to take a screenshot and share it with the world, or save your creation and try it out with other songs! The Trip is another one of Harmonix Music VR’s more “sit-down and chill” experiences, though not for the faint of heart. Would you like to climb inside a kaleidoscope? Leave your body behind and take a journey through your soundtrack with this abstract, psychedelic, song-driven experience. Get the dance party started with The Dance. This world lets you to choreograph dance moves for wacky characters. Once you’ve got the party going on the dance floor, you can go to town with a variety of toys at the DJ booth, and even wreak havoc in Giant Mode. Did we mention that you can eat cake? Well, virtually that is. 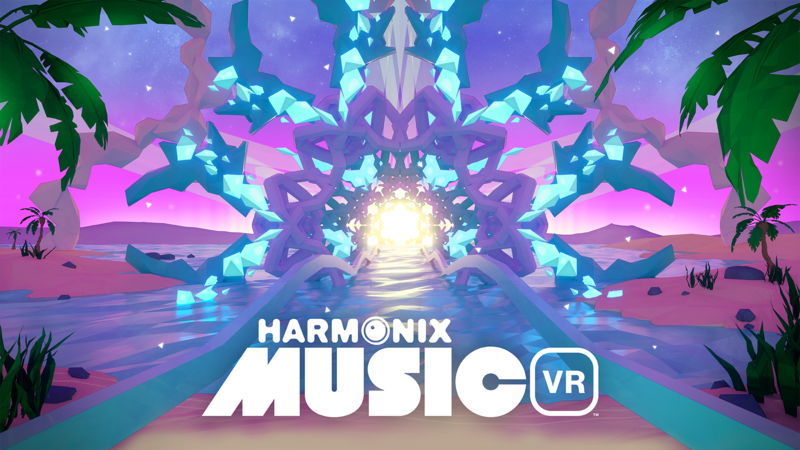 Unlock Your Music Library With Harmonix Music VR! You’ve waited to experience the music you love like never before with Harmonix Music VR, and that wait is over! That’s right, Harmonix Music VR is now available! Last week was E3! I had the privilege, along with QA Lead Chris, to fly to LA to show off Harmonix Music VR. We had the opportunity to demo for a bunch of lucky fans and press following the big PlayStation press event on Monday night. It was exciting to show off our weird and wonderful experience, and to catch glimpses of all the other titles Sony has queued up for the PlayStation VR.